Home RealJStreets Lag Ba-Omer Guidelines or Gaglines? 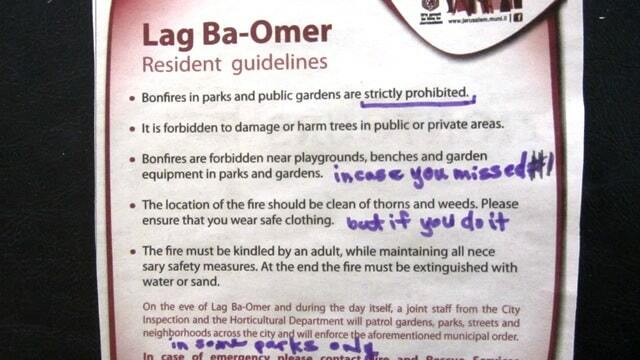 Lag Ba-Omer Guidelines or Gaglines? Living in Israel, sometimes you just have to laugh at even at the most serious topics. Take for example, the Jerusalem municipal safety guidelines published in the English press for Lag Ba’Omer. Then be sure the location is “clean of thorns and weeds” …when you start your fire in a park. One can joke about “necesary” misspelling, but safety warnings this year with strong winds were not a joking matter, many people had their clothing ruined by flying sparks. Some traditional bonfire locations, like those in Gan Sacher were patrolled and people did have to move their bonfires. So for next year, be careful out there. You have to know which parks are the right ones in which to light your fires. and thank David M for making us aware of this ad.